I needed some space to layout a few blocks, so I packed up my projects and headed to my mom’s house. She has a fantastic studio with a big design wall. I laid out the blocks that I won last year from Block Lotto. The lotto guidelines were any pattern with a blue, tan and cream color scheme. I added the red sashing. I think it will make a nice Quilt of Valor when it’s done. I mention QOV quite a bit…if your family is well stocked with quilts and you need a destination for your creative efforts, please consider Quilts of Valor. They have standing requests for quilts to comfort our wounded warriors as they arrive at various hospitals, and we fall short of meeting these needs. 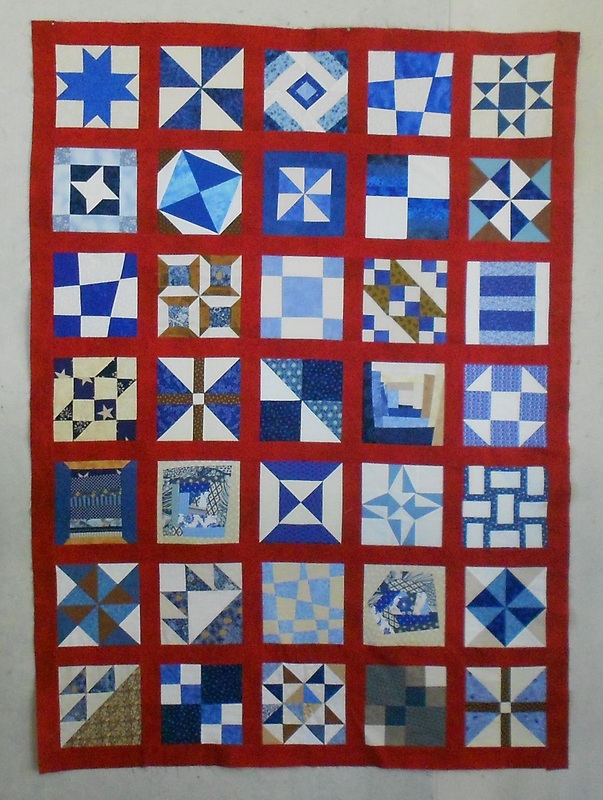 PLEASE, check out the Quilts of Valor website and make a donation! 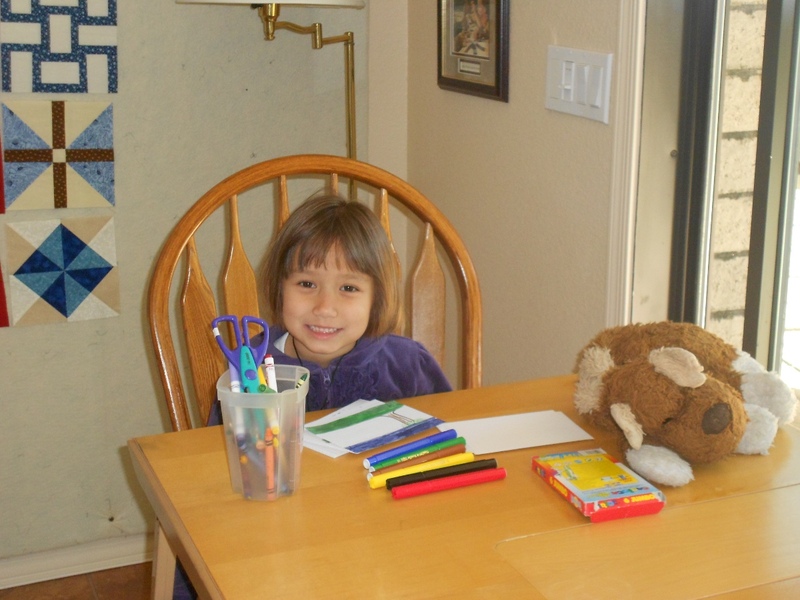 My little princess has quite a stock of art supplies at Grandma’s house, so she was set up and working on cards. 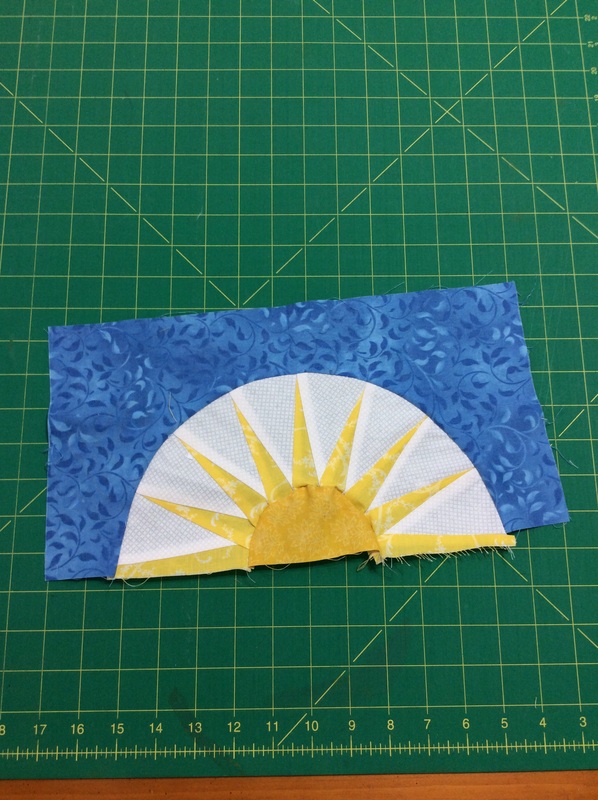 In no time at all, I had the borders on and the top is ready for the longarm. 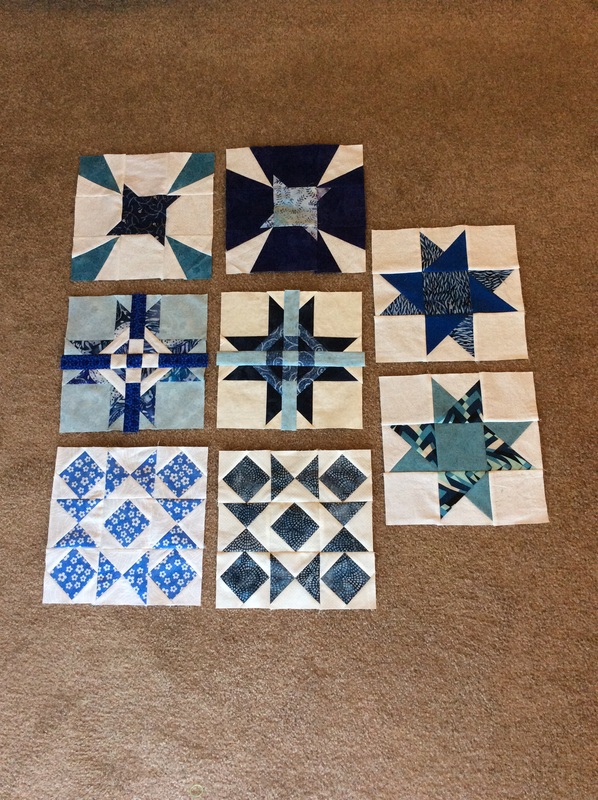 Next on the design wall: my Fat Quarter Stars. 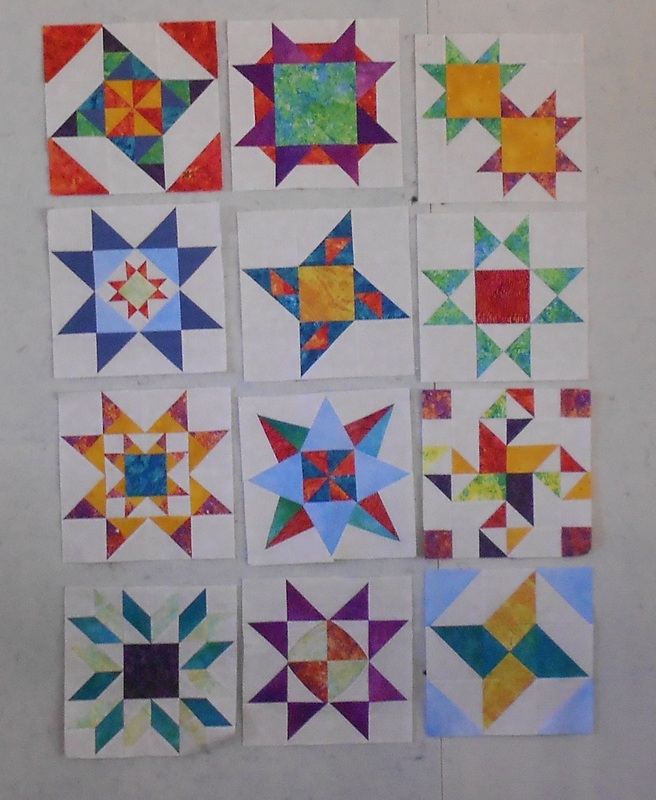 The patterns came from the Quilt Along at Moose on the Porch Quilts. Then, it was time to go home. I will add a variety of colors for sashing these blocks. I thought about putting the blocks on point, but I don’t want to do the math for the setting triangles, LOL. Too many other projects waiting! The quilters who participated in the FQ Stars QAL posted photos in Flickr, so search for that group to see other spectacular color ways. Most of my fabric came from the Stonehenge line from Northcott. One more day to enter the Blog Hop Giveaway! I am offering two fat quarters and some charm squares. You must comment on this post. #1…Ask questions if you are unsure about something! 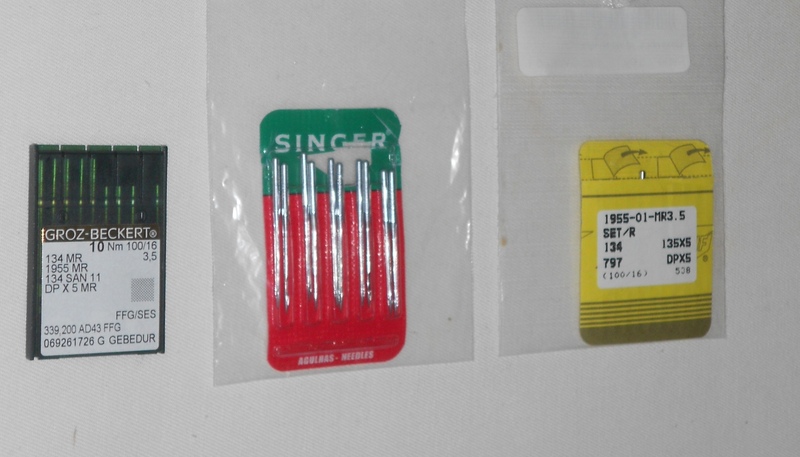 Here you see the packaging for three similar needles. I ran out of the size I usually use on my longarm. At our recent state-wide quilt show, I stopped at the Superior Threads booth and picked up the box on the left. Of course, I left home without my old package for comparison, and the staff was understandably busy at the show so I didn’t take time to ask the silly question of “Will these work in my longarm?”. These were titanium needles and the shank was just a bit too big to fit my Gammill. At home this afternoon, I opened the package and noticed the new needles did not have the correct shape. Grrrr, back down to the local store. Of course, they cannot accept an opened package, but the saleslady was able to direct me to the longarm supply section and I found the identical match for my yellow package! Ahhh, back in business. Classic lesson, learned the hard way – the only silly question is the one not asaked! #2…background sections should use the background color I have made all the blocks for the Fat Quarter Stars Quilt-Along hosted by Moose on the Porch Quilts. The top star was my original. None of the other blocks had a dark background, so I decided to make another version that matches the other eleven blocks, with a cream background. My points don’t match as well, but that will quilt out (wink wink). 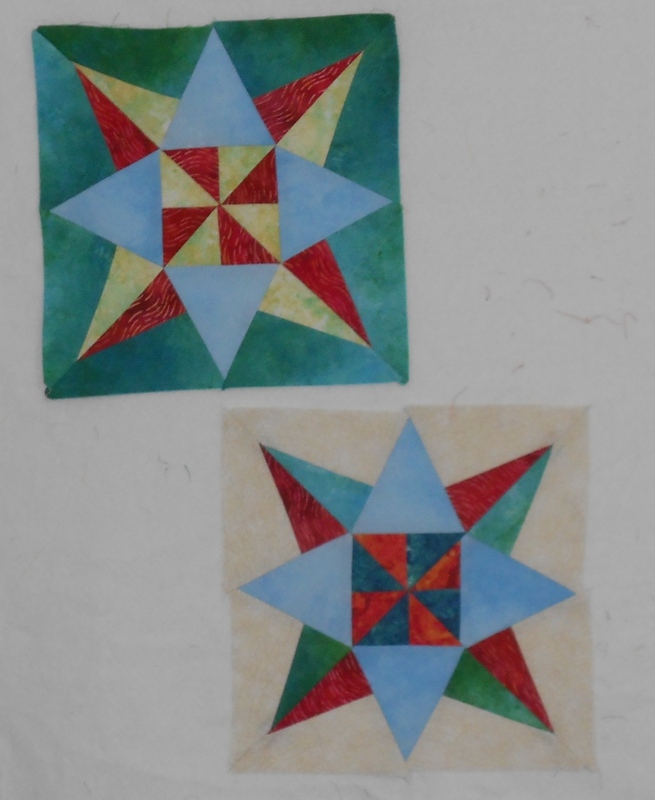 And now I’m wishing I had used the outer red in the center pinwheel, but I am NOT doing this one over again! Classic lesson learned the hard way – think of your overall color palette and keep the background color consistent! Remember, the Quilting Gallery Blog Hop Party and Giveaway post is HERE. 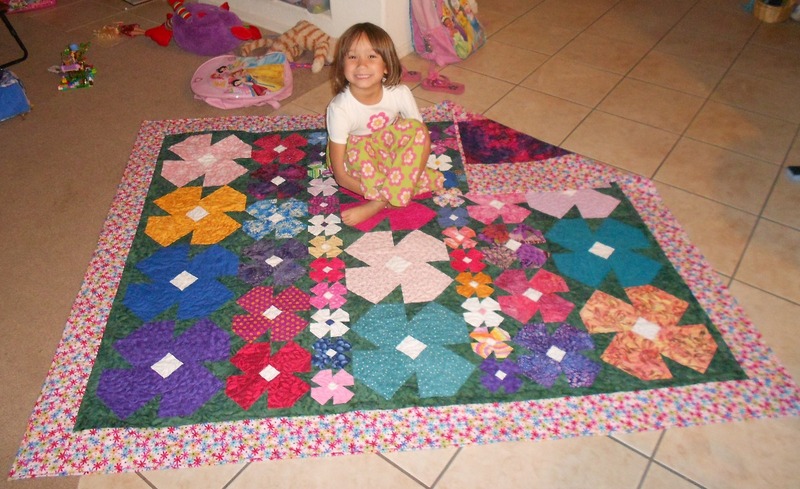 I used a pattern that was shared during the 2011 Block Lotto to make a quilt for Kendra. I had so much fun with this one! Kendra enjoyed picking out the bright fabrics, and we loved watching the garden grow, lol. 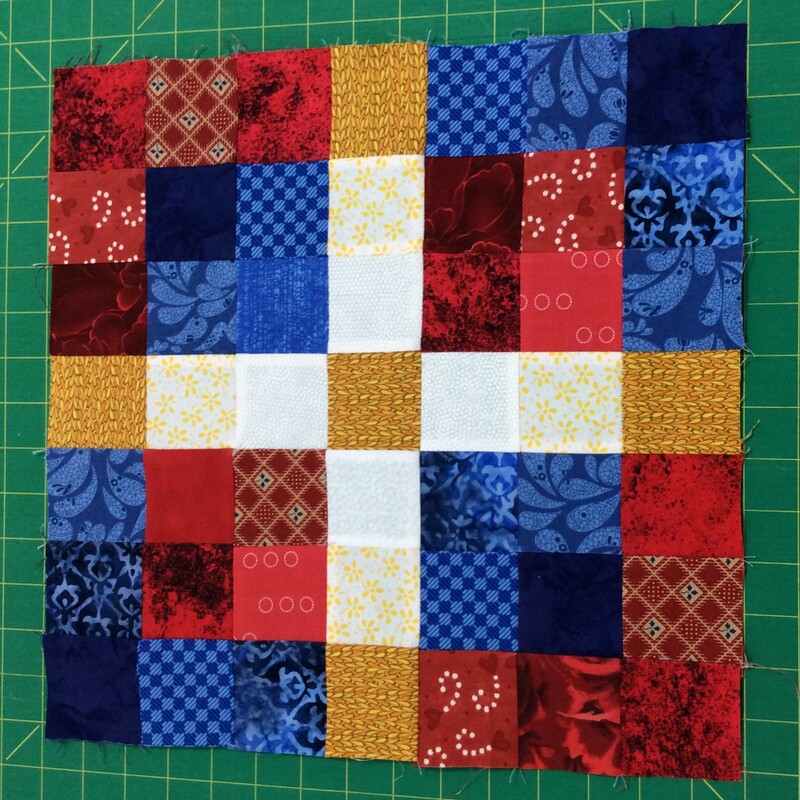 In the grand debate about chain-piecing versus sewing each block, I am a true Libra – looking for that middle-of-the-road balance. There were 48 flowers in the top…I would cut pieces for 6 – 8 blocks, then piece those. I need the satisfaction of seeing the completed blocks as I work. 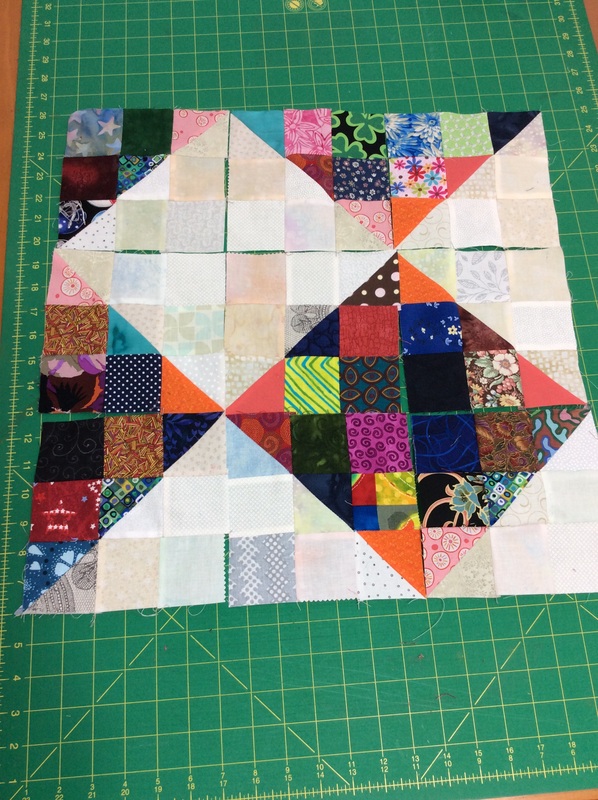 But, that is not a set-in-stone rule…I also love to sew mystery quilts where you cut pieces for one step at a time and don’t see the full pattern until the very end. Speaking of Block Lotto, our hostess Sophie is doing a great job with this year’s selections. 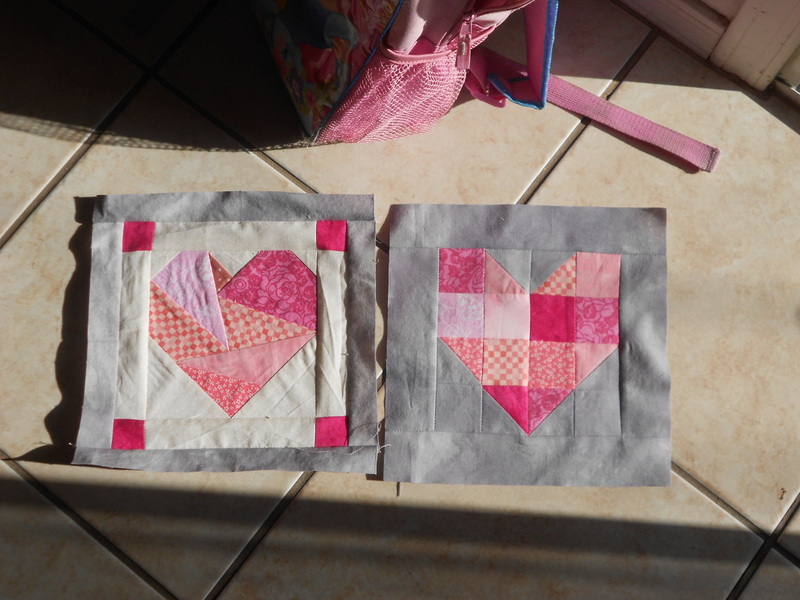 In February, we could pick any pattern we liked with a heart. Colors were pink, cream, grey and orange. 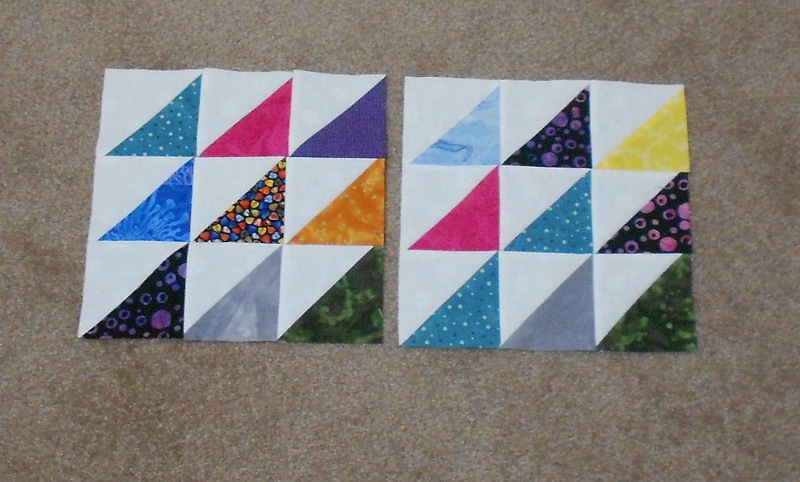 I found a Carol Doak paper-pieced block, and also drafted my own with 2in squares. I finished another one after I snapped this picture, and I have plenty of scraps to make my limit of nine this month. One more week of school, then it’s quilting every day during spring break! 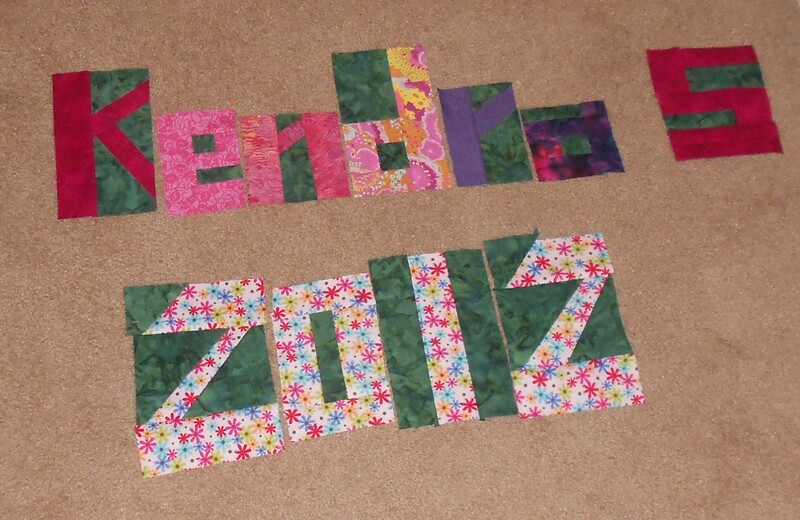 I am working on the back of Kendra’s flower quilt. I used the book “Word Play” to build these letters and numbers. I think I have to try the little ‘a’ again with more contrast. I will fill in around the letters with the green background, then bring it up to size with more of the flowery fabric from the numbers, and some of the other pink and purple scraps. I found some fun fabric last year that had phrases such as “Whatever” and “Totally” on it…perfect for preteen girls, LOL. That may work it’s way into this quilt too. I am hoping to get this on the longarm this weekend, and use a butterfly pantograph to finish it. It’s so close to being done, hooray!